Prepare for laughter and mischievous fun, as Sally and her brother once again take audiences on a wacky adventure hosted by the one-and-only Cat in the tall red and white hat! 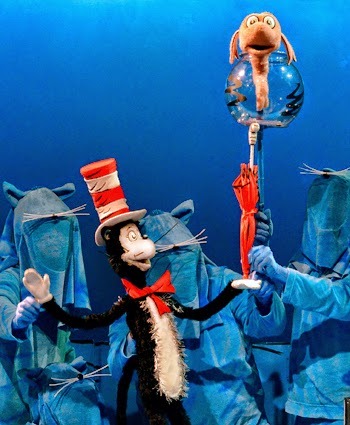 Back by popular demand, Dr. Seuss’s The Cat in the Hat is presented June 12- July 20 at the Center for Puppetry Arts in the Mainstage Theater. With plenty of rhymes, tricks and wit, Dr. Seuss’s classic tale will transport audiences from the page to the stage, as the performance brings the iconic illustrations from the book to life for all to enjoy. Adapted by Katie Mitchell and directed by Jon Ludwig, Dr. Seuss’s The Cat in the Hat features tabletop and rod puppetry styles performed by skilled puppeteers Dolph Amick, Brian Harrison, Reay Kaplan, Seth Langer, Eliana Marianes, and Tim Sweeney, with performance interns Shari Bohnsack, Jake Krakovsky, and Abbey Sanders, and understudy Megan Jance. All of the puppets, props and costumes were created onsite by the Center for Puppetry Arts’ talented staff. If you are still unsure about taking the kids to this show here are our top 5 reasons why you should not miss it! 1. Beautiful stage, whimsical marionettes, cool special effects and a rain of bubbles during the show! 2. Encourages kids to use their imagination: Play, including imaginative play, prepares the child for adulthood, play teaches him his place in the world, and play teaches him how to interact with the world. It is play that, in the child’s early years, lays a strong foundation for the physical, academic, social and emotional wellbeing that will last a lifetime. A child NEEDS to play to grow. 3. It teaches kids how to rhyme words: The recognition of rhyme may be the entry point to phonemic awareness development for many children. Research indicates there is a correlation between phonological awareness and reading ability. Working on rhyming skills is usually part of most programs of reading instruction for that reason. 4. It will make your child laugh and giggle during the entire show. I've seen a lot of puppet shows here and The Cat In The Hat has been the one that makes little kids laugh the most. 5. Kids can make their own Cat in the Hat Shadow Puppet to take home at the end of the show. · Tuesday- Friday: 10 a.m. & 12 p.m.
· Saturday: 11 a.m., 1 p.m. & 3 p.m.
· Sunday: 1 p.m. & 3 p.m. The Center will be closed in honor of July 4; no performances on that date. Tickets include Museum admission and entrance to the Create-A-Puppet Workshop (or To-Go Kit), where children can make their own Fish Shadow Puppet to take home with them as a reminder of their Seuss-tastic adventure.